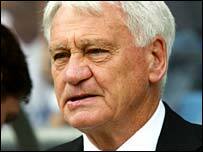 Former England manager Sir Bobby Robson has denied that he is in talks over a return to international football as the Republic of Ireland's new boss. The Football Association of Ireland will this week make a decision on the future of current boss Brian Kerr, whose contract ended last Wednesday. "I know nothing about it, it is pure speculation," Robson told BBC Radio Five Live's Sportsweek programme. "As far as I'm concerned, the FAI have a very good manager in Brian Kerr." Kerr's contract expired after the Republic's 0-0 home draw against Switzerland on 12 October, which ensured that his side did not qualify for next year's World Cup finals in Germany. The FAI will meet on 19 October - and are not expected to renew Kerr's contract. Former Celtic boss Martin O'Neill and Aston Villa manager David O'Leary have all been mentioned in connection with the role. But Manchester United boss Sir Alex Ferguson has ruled himself out, saying he will quit football altogether when he leaves Old Trafford. "When I'm finished here, I'm finished. Believe me, you do not leave Manchester United and go anywhere else, club or country," he told the Mail on Sunday. "There will not be another job."